Have you ever considered Landscape Lighting installation for your home and property? The ultimate way to add curb appeal to any property is through Landscape Lighting installation. TechPro Security, experts at all things low voltage like Alarm Systems and Security Surveillance Cameras and Landscape Lighting Installation. If you need Landscape Lighting West Palm Beach, Landscape Lighting Boca Raton, Landscape Lighting Fort Lauderdale, Landscape Lighting South Florida installation services call today and see how we can liven up your property. 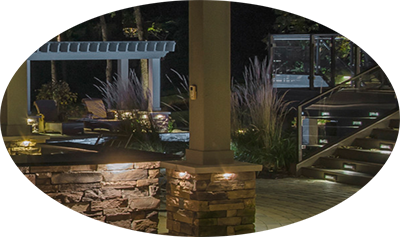 TechPro Security Products has been located in Boca Raton for over ten years offering the absolute best landscape lighting installation services. We are lighting pros dedicated to providing a brilliant landscape lighting environment for your home, property or business. TechPro Security Products takes enormous pride in all of their installation services. Their workmanship is renowned and our technicians enjoy nothing more than delivering complete satisfaction to our clients. TechPro Security Products has established relationships with leading landscape lighting LED providers. This helps us deliver the highest quality LED Landscape Lighting products while keeping cost and expenses related to the installation as low as possible. In addition to working with individual homeowners and businesses, we also work hand and hand with real estate professionals, brick and paver companies, pool builders, architects and contractors alike. At TechPro Security Products, many of our clients have been with us for a long time and we strive to establish a relationship where longevity and honesty is at the forefront. We hold a strong belief that the landscape lighting we install today will just as marvelous in ten years. TechPro Security Products also provides full repair and maintenance of our landscape lighting systems. Call today if you have any questions about Landscape Lighting West Palm Beach.